I've been quiet as far as my blog goes, but I have been busy beading. I recently joined the Beading Babes, and online beading group. I've made the two projects for this round. Both are by designer Helena Tang-Lim and both incredibly easy to make. As always the most time consuming part of any project is locating the necessary pieces and choosing the colours. I found some coin shaped beads at Yashmacreations. project for now. Anyway, I've really happy with how my necklace turned out - below. The other piece was an easy and fast project to make up. I love how satisfying that was. It really does tempt me to make it in many other colours. Here's the image of my version of the Four Leaf Clover Cuff - below. I hope you enjoy viewing these pieces. Please take the time to look at the other pieces created by the other Beading Babes. Your necklace and cuff are gorgeous! I love the color palettes for both pieces. Are the disks in the necklace gemstones? They are so pretty. Wow! I love your beadwork! Come by my blog for a little giveaway ending on June 25th. Both of those are just beautiful. I love the colors you chose. The gold pearls in the bracelet go so well with the silver and blue. Wonderful work. Beautiful work Heather. 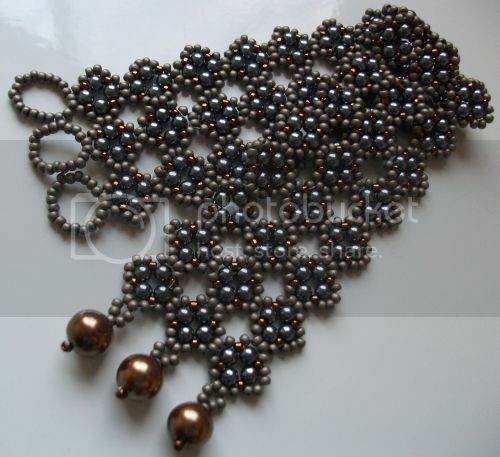 I absolutely adore your Nefertiti necklace - those disc beads are gorgeous. Thanks so much for taking part in Beading Babes. I look forward to seeing you for Project 6! 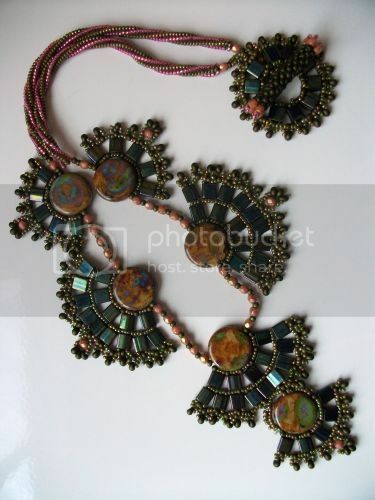 I love the disc beads and the colors you used with them. The perfect setting for them! I can see how the Four Leaf Clover can make you want to experiment with different color combos but the one you chose is very nice! Nice work. I especially like the coin beads you have used in EON. Nice work I especially like the necklaces it is so elegant! Great work Heather. I love the colors of the discs with the Tilas you chose.